Mostly Negative (33) - 39% of the 33 user reviews in the last 30 days are positive. Mixed (8,323) - 66% of the 8,323 user reviews for this game are positive. Check out our Assault Rifle! What do you think? Can you see yourself blasting a few creatures with one of these? 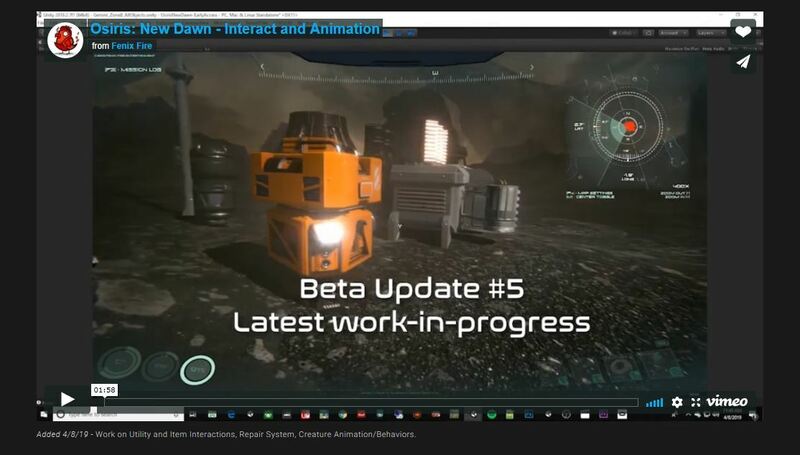 Please be sure to head over to our website, where you can watch a new video of our latest work-in-progress for our Beta #5 Update! The link will be listed below! An uncompromising open universe space survival game that takes place during the year 2078. Explore the Gliese 581 solar system and colonize its worlds of incredible wonders while braving the unforgiving dangers of space travel. We bring to you, Osiris: New Dawn. Available Now In Open Beta! Space travel, three new planets, huge graphics/performance improvements, and a lot more! It’s finally here! Travel freely from one planet to the next in your spaceship and explore the entire solar system! Absolutely no load screens after initial load. Travel into underground hives, explore vast planetary surfaces, fly into low orbit, and now travel through the vast reaches of space. Go where you want - it’s totally up to you! Now that we have space travel, we’re celebrating by adding three new planets - each a completely different biome modelled and created using scientific data. A hot Super Earth, Seraph has a dense, heated atmosphere and is steaming with life. Sits directly at the edge of the gas giant’s rings. Much like Earth’s moon, Lutari has no atmosphere and it’s low gravity makes simple traversal relatively easy. The primary mode of Osiris: New Dawn is now considered “Colonize” mode where you must explore, discover, and colonize every planet and moon in the solar system. Set up drone mining lines, establish bases, and doc at each world in your space station, going planetside by using your space vehicles. Once on the surface harvest minerals, gasses, and plants in your bio farms, all while steering clear of the countless dangers of space in this new frontier. The Explorer Update marks the beginning of this mode, and will continually get more robust with further developments. Massive FPS boost and complete graphics overhaul delivers a visual treat at super high frame rates, even with planets full of foliage, creatures, and trees. This is all possible due to refined shaders, materials, and Unity’s new Post Processing stack. We’ve refined the camera systems, lighting systems, and terrain to achieve the highest levels of detail possible, all with lightning fast speeds. Since we’re in the process of adding new Colonize and Mission modes, the Main Menu UI has been completely reworked to allow you to view and survey the solar system, as well as easily review your avatar and explore the available missions in Mission Mode. We’ve also updated the in game HUD and UI to allow for backpack review while traversing and while in vehicles, along with other countless improvements, fixes, and tweaks. We listen very closely to our players, and take into consideration all unique enquiries and feedback. Some features we’ve added during our time in Early Access did not resonate as much as others, causing these certain features to be currently on hold. - SKILL TREE - Will be replaced by a new system that fits the subject matter closer. - CLASSES - May come back in Creative Mode, but in order to make classes worthwhile would take the game in a very specific direction, relying much more on character advancement and specialized class abilities. We’re not confident that this would/has added to the game. - PUBLIC PVP SERVERS - This is tough one - but we found that trying to explore a new world while getting attacked and shot at by other explorers does not fit the spirit and subject matter of our game. We like PVP, and are looking at other ways of including a PVP mode, possibly in a custom server option. - MALE/FEMALE/SHAPE CUSTOMIZATIONS ON AVATARS - As much as we like these features, we chose to put them on hold in order to get the space travel and new Main Menu systems in. These will likely be added back in the coming updates. - MULTIPLE AVATARS - Having a variety of avatars makes the upcoming modes a bit muddy, so we’re exploring the idea of one astronaut avatar in the game - we’re hoping this adds more value to your avatar and player progression, while also allowing for flexibility in your private universe by allowing you to play your avatar in any Mission or Universe. Depending on how this goes, we may bring back multiple avatar banks in Creative/Custom Server mode, which we would like to keep on our roadmap. The following features are at the top of our development list, most of which are coming along very well and just need to be added to our main development branch. Craftable Spaceships, Rockets, Robotics, and Land Vehicles - The Laboratory will become a giant, fully functional crafting center which will create a variety of parts for high tech machinery. You’ll be able to fully customize different types of spacecraft, land vehicles, and drones, all with specific abilities and properties to help you colonize the solar system. AI/Combat Improvements - Creature grappling, smarter pathfinding, and stealth combat, have been explored and will be coming soon to make the combat in Osiris truly terrifying and visceral. Solar System Creator - Customize your very own solar system, along with stars and planets, to share and play with your friends! Decide what minerals, flora and fauna, atmosphere, and creatures you choose on each planet, provided it works scientifically. As always we’re completely open to your feedback as we really want to make Osiris: New Dawn the best game it can be! Drop us an email at houston@fenixfire.com with any thoughts or suggestions. You can also reach out to us on social media where we communicate with our players daily.